Mikuru Asahina is a high school sophomore who was 'kidnapped' by kouhai (younger student) Haruhi Suzumiya and forced into joining the SOS-dan solely because of her Moe looks, large breast size and youthful face. In truth, she is a time traveler from the future sent to keep an eye on Haruhi, who, in her faction's view, is the origin of time quakes. Despite coming from the future, she seems to have no futuristic equipment on her aside from a time-travel device she's mostly unauthorized to use (time travel is serious business). At times, she puts her hand on her head when communicating with the future. Her age is one of the many pieces of "Kinsoku Jikou" (Classified Information) she has: it could be that she's younger than Kyon and the other first years. Her naïveté may suggest this, although it might be because the future she comes from is so different to our time. For example, she was puzzled at a boat and how it floated, how the sea is salty, and so on. One of Mikuru's missions is to keep Haruhi happy. After all, if Haruhi sours, the world will suffer dire consequences. Mikuru is a naturally shy and timid girl. This means she offers little resistance (beyond token screaming and futile struggles for extra Moe) when Haruhi "cos-rapes" her or gropes her. She has become Kyon's holy eyecandy: necessary stress relief for the poor guy who has to deal with Haruhi on top of various SOS-dan related incidents behind her back. Haruhi ordered her to become the SOS-dan Maid. Surprisingly, she takes the job seriously: carefully observing a professional Maid to learn mannerisms and brewing ever better tea. And then there is Adult Mikuru. Since she's a time traveler, it's not surprising an adult version of her would visit. The years added to her bust and charm even further. She becomes more assertive and confident too, yet she still freezes when Kyon states "Wait! I must ask you one question!" Even more of her secrets that are revealed in novels have yet to be animated. So Mikuru's mission is to keep Haruhi happy. But is she really content with living under Haruhi's shadow? After all, she entered the 2006 Saimoe cirucuit along with Haruhi. Though she performed well up to the knockout stages of Korea Best Moe, Mikuru was knocked out in the round of 32, losing to Sakura Matou (Fate/Stay Night) by only 9 votes. She performed slightly better in Saimoe Japan, literally cruising through the first few rounds only to lose to fellow SOS member Yuki Nagato (Suzumiya Haruhi no Yuuutsu) by 85, therefore finishing in 12th place. Then, the usual - Haruhi got bored, probably thanks to her dismal performance, so the SOS Brigade didn't enter the 2007 Saimoe Circuit. But an invitation to Korea Super Best Moe in 2007 was an opportunity that couldn't be passed up, and all three entered the competition. In the preliminary round, Mikuru did fall short to Shana (Shakugan no Shana), but she edged Tsukasa Hiiragi (Lucky Star) by only 10 votes. However, this only led to a 48 vote loss to Maria (Hayate no Gotoku) in the round of 16. With a second season currently in production, Mikuru is expected to participate in the full Saimoe Circuit sometime in the near future. 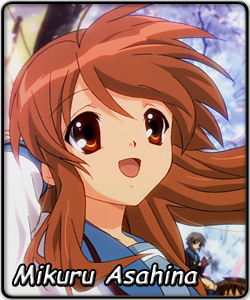 However, in the new International Saimoe League, Mikuru could set out to prove that she is not just Haruhi's play-toy. Should all things fall into place, Mikuru could be able to take home the International Saimoe tiara.